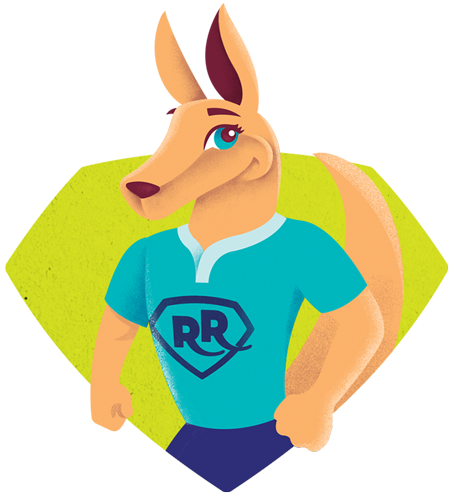 Register your child’s interest in RugbyRoos and they will receive a free welcome gift containing a RugbyRoos keyring, pencil case, ruler and tattoos. Every kid deserves the opportunity to grow up strong, confident and resilient, and be given the chance to unearth those ‘powers’ to become heroes in their own right. That’s the aim of RugbyRoos. More than just a safe and friendly introduction to rugby union, it’s an opportunity for both boys and girls to learn important life skills of discipline, respect, integrity and solidarity. And it’s great fun! Enrol your child today and help them release their inner hero. The RugbyRoos program is proudly supported by RugbyWA. The kids will be coached by professional rugby players and RugbyWA development officers to learn the core skills of running, kicking, throwing and catching. RugbyRoos introduces children to rugby in either a non-contact format, or through our specialised ‘introduction to safe tackling’ course. Whichever course you choose, your child’s safety is monitored at all times. RugbyRoos welcomes your family into the rugby community, with the 5-week program being offered at rugby clubs across WA. During the one hour sessions, your child will make friends as they develop core rugby skills through a series of programs delivered by professional rugby players and development officers. Kids develop core skills such as running, kicking, throwing and catching as well as broader skills such as balance, teamwork, physical agility, listening to instructions, and hand-eye coordination. It’s fun, safe and inclusive for both boys and girls.